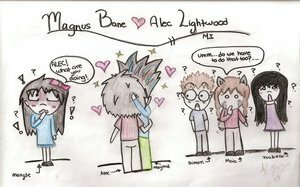 Alec And Magnus kiss. I didnt draw this. I got this off a website but thought it was too cute. Its my wallpaper.. Wallpaper and background images in the Alec & Magnus club tagged: alec lightwood magnus bane kiss city of glass. I didnt draw this. I got this off a website but thought it was too cute. Its my wallpaper. One of my fav moments in the book!